Since the United States stepped back from the abyss in the aftermath of the Great Recession in 2008-09, the American economy has performed at a steady clip. The stock market climbed to dizzying heights, corporations, insurance companies, banks and the business elite are awash in billions. And significant portions of the nation’s wealth—with the help of congressional Republicans and other politicians—have been siphoned from the middle class and modestly wealthy and directed into the coffers of the uber-rich. A recent report from the Economic Policy Institute says there are consequences and danger here: Material wealth that should come from the labor of working people is not and has not reached the majority of working Americans. The end result for workers is nightmarish and the seeds of social upheaval and erosion of democracy loom, warns one of America’s leading economists. The report’s author, Elise L. Gould, says rising wage inequality and sluggish hourly wage growth have defined the U.S. labor market for nearly four decades, despite steady growth in productivity. Wage inequality worsened between 2000 and 2018, with the highest paid workers being the primary beneficiaries, she says. Because of structural racism and other barriers to Black advancement and success, Blacks, in general, and Black women, in particular, are faring worst. America’s working class is caught in an economic vice fueled by decades of stagnant wages; the weakening of organized labor by Republican lawmakers; gaming of the system by politicians; minimum wages for fast food and service jobs; unemployment; the spiraling cost of food, medicine, and rent; gentrification, foreclosures, and the paucity of affordable housing. “It seems like people are working really hard and low-income workers are more educated than ever before. But the data make it clear that millions of people who are active participants in the labor market are unable to make ends meet, either due to insufficient hours or low wages,” he observes. “The basic perquisites of a middle-class life, including a secure old age, are no longer attainable for most Americans,” he continues. Seattle investor and businessman Nick Hanauer echoed Dr. Gould, who when asked, said that America’s capitalist model would be rendered unworkable if the middle and working classes make so little they can’t buy goods and services they need. The “fundamental law of capitalism must be: If workers have more money, businesses have more customers. Which makes middle-class consumers, not rich business-people like us, the true job creators. ... Which means a thriving middle class is the source of American prosperity, not a consequence of it. The middle class creates us rich people, not the other way around,”insists Mr. Hanauer, who invested in Amazon as its first non-family investor when it was a start-up. He has founded, co-founded and funded more than 30 companies, including founding aQuantive, an Internet advertising company that he sold to Microsoft in 2007 for $6.4 billion cash. Former FAMU law professor Dr. Cori Harvey said she has been watching the relentless hollowing out of the middle with growing concern. The drumbeat of challenges could lead to its collapse, but she says she’s optimistic conditions will improve— but only after they get worse. Dr. Harvey, a legal consultant and former a former Philadelphia public defender, argues it is incumbent on Black Americans to change their habits and behaviors, start watching news programs and read about how to make money, make good choices and prioritize their spending, get involved politically and vote wisely. Prof. Stiglitz has been a frequent and caustic critic of the American political and economic system, saying not just that the U.S. economy is rigged, but also warning of the toxic fallout to individuals and institutions if nothing is done. Professor Stiglitz, who won the Nobel Prize in 2001 and who teaches at Columbia University, has been sounding the alarm for years. He argues that the 1 Percent have accumulated so much political power and wealth in recent decades—using dark money, gerrymandering and voter suppression—that the U.S. has paid a high price and its democracy is imperiled. The ability of those with modest means to enjoy social mobility have dissipated for the most part, he argues. “It’s no use pretending that what has obviously happened has not in fact happened,” he writes in another article titled, “Of the 1%, by the 1%, for the 1%.” “The upper 1 percent of Americans are now taking in nearly a quarter of the nation’s income every year,” he says. Even as workers struggle to make ends meet, a 2016 EPI report showed that CEOs in Fortune 500 and other top companies made more in two days than an average employee did in a year. Chief executives at 350 companies made $15.6 million on average in 2016—271 times what the typical worker earns. And even though CEO compensation has fallen slightly in the past few years, it has increased by more than 930 percent since 1978. The report notes that CEO pay has grown faster than the stock market. 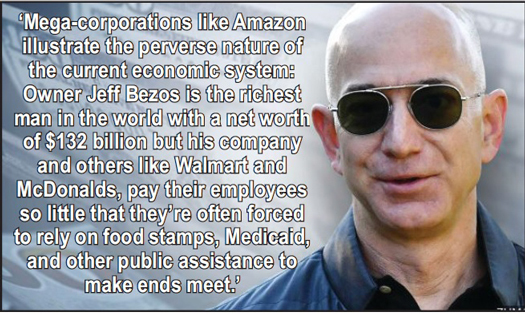 Mega-corporations like Amazon illustrate the perverse nature of the current economic system: Owner Jeff Bezos is the richest man in the world with a net worth of $132 billion but his company and others like Walmart and McDonalds, pay their employees so little that they’re often forced to rely on food stamps, Medicaid, and other public assistance to make ends meet. Doug Smith, a former partner at the McKinsey Management Consulting Firm, in discussing the stunning pay gap between CEOs and employees, argues the economic costs of huge pay gaps go far beyond the problems of low employee morale and high turnover. “Our country is rapidly becoming less a capitalist society and more a feudal society. Unless our policies change dramatically, the middle class will disappear, and we will be back to late 18th-century France. Before the revolution. And so I have a message for my fellow filthy rich, for all of us who live in our gated bubble worlds: Wake up, people. It won’t last,” he warns.